Sleep plays a critical role in child development, with insufficient sleep or sleep disorders linked to poorer physical health, increased weight gain, academic deficits, behavior problems, and difficulties with emotion regulation. 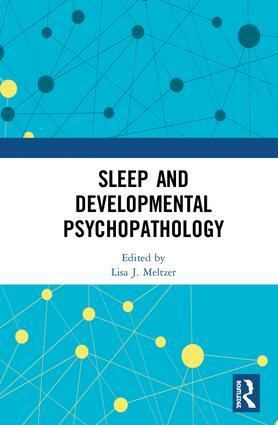 This book examines the complex and dynamic relationship between sleep and developmental psychopathology. By focusing on broad topics such as social and emotional development or child well-being, as well as specific disorders including ADHD, anxiety, and bipolar, many different aspects of developmental psychopathology are considered. In addition, a breadth of studies examine different measurement approaches and sleep as an underlying mechanism for the development of behavior, social, and emotional problems. This collection of novel research studies exploring the intersection between sleep and developmental outcomes is essential for clinicians and researchers who work with children and adolescents. This book was first published as a special issue ofthe Journal of Clinical Child and Adolescents Psychology. Lisa J. Meltzer is an Associate Professor of Pediatrics at National Jewish Health, USA. She is board certified in Behavioral Sleep Medicine by the American Board of Sleep Medicine and is the co-author of Pediatric Sleep Problems: A Clinician’s Guide to Behavioral Interventions (2015). She also has a funded program of research examining the impact of sleep on health outcomes in youth with chronic illnesses and their parents, the development and validation of objective and subjective measures of pediatric sleep, and the impact of changing school start times on health outcomes.